This buttons is perfect for a classic Street Fighter set up and they are only for metal control panels, please usb OSBN-30 Button if you want to cover your panel with lexan. This Buttons use for replacements in existing Fighting sticks as well as arcade cabinets or treat your new arcade cabinet build to a touch of quality. These buttons have built in terminals and are super quiet compared to pushbuttons that have clicky sounding microswitches instead of a fixing ring, they have a clipper on each side that locks in position when mounted in your control panel. 6 x High quality 30mm Arcade Push button. 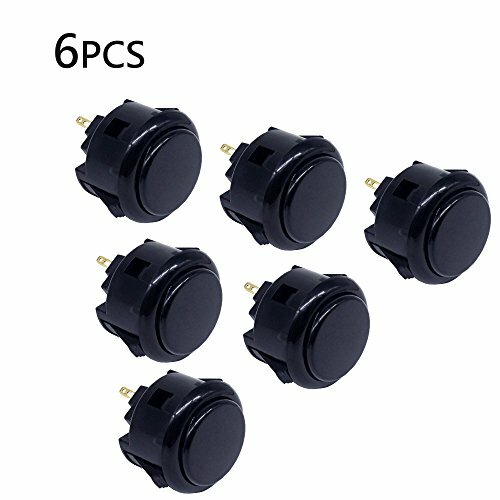 ✔【EXCELLENT PERFORMANCE】 Looks great, works perfect,quiet and very durable.They fit very snug into the button holes and don't move around, and are very sensitive, helpful for quick presses.Easy To Install For Your Machine,perfect for modding or building your own joystick. ✔【 COMPATIBLE】Fits in most Hori and MadCatz joysticks. ✔【QUALITY】 High quality buttons.Mounting Hole Diameter: 30mm. Microswitch reliability tested to 10,000,000 cycles. ✔【WARRANTY 】 30 Days Money back Guarantee.We provides 18-Month worry free warranty for our Product. Please contact us before if have any problem. If you have any questions about this product by YUNDA, contact us by completing and submitting the form below. If you are looking for a specif part number, please include it with your message.